Champagne diamonds are beautiful naturally, which is to say, they're not artificially colored. They range in color from the light, bright hues of candlelight and champagne bubbles, to the warm, medium hues of honey and caramel, to the rich, dark tones of amber and cognac. These alluring stones make a bold statement about your individuality and personal style. This champagne diamond engagement ring is from the Topazery Earth Collection. 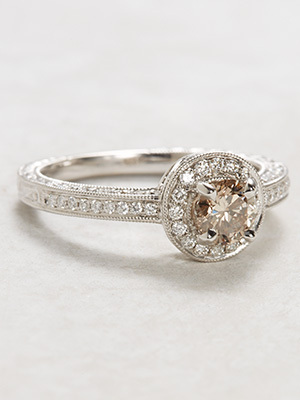 A halo design mounting cradles a fancy champagne diamond in this vintage style ring. 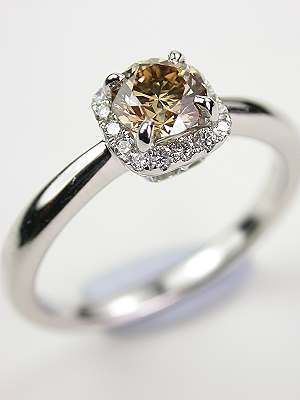 The color of the champagne diamond is Fancy yellow Brown. It is encircled by a collection of sixteen round full cut diamonds. The 18k white gold band of this engagement ring is polished to a smooth sheen. This is an vintage style (new) ring from the Topazery Earth Collection. The path not taken often leads to the most unexpected surprises, and this antique style filigree engagement ring thrills from all directions. The 18k white gold band of this engagement ring is carved in a paisley filigree pattern along the shoulders where it is accented with thirty-four round full cut diamonds. This 0.16-carat collection of diamonds flanks a 1.01 carat fancy colored diamond. This champagne diamond has a fancy orange yellow hue. 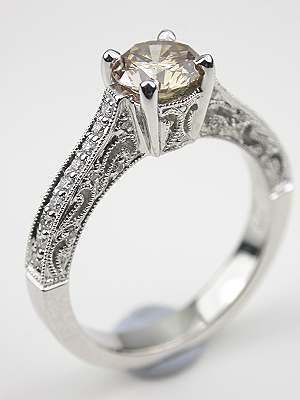 This is a new filigree engagement ring from the Topazery Earth Collection. White diamonds drizzle down and sparkle around the sizzling champagne diamond that centerpieces this engagement ring. Like the bubbly beverage it's named after, this engagement ring's centerpiece champagne diamond effervesces warmth and radiance. A collection of white diamond accents orbit around the champagne diamond like a glowing full moon. 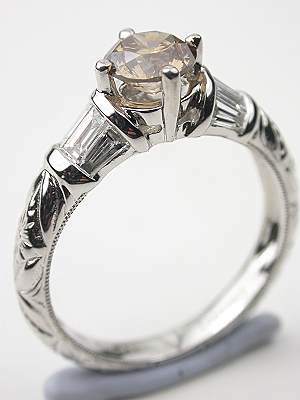 The band's fancy scroll work gives a vintage touch to this charming engagement ring. Details: Vintage Style. New. 18k white gold. Round brilliant cut diamonds; 0.39 carats. Round brilliant cut champagne diamond; 0.55 carats. The warm glow of candlelight radiates from this timeless ring. The warm glow of candlelight radiates from this timeless ring. The platinum band of this engagement ring is set with a collection of round brilliant cut diamonds that have a combined weight of 0.30 carats. A champagne diamond is prong set at the top and accented by diamonds on the under bezel. A matching wedding band may be purchased separately. This is a new ring. 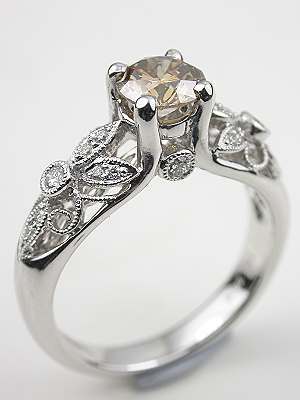 Flowers and leaves create a fresh vintage look in this champagne diamond engagement ring. Set in 18k white gold, the band of the engagement ring is fashioned in a floral and leaf diamond-accented design. A 0.72 carat champagne diamond is prong set at the center of this garden inspired medley of glitter and gold. This is a new ring from the Topazery Earth Collection. 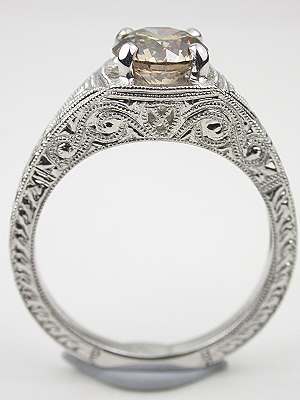 A champagne diamond provides the razzle dazzle for this antique style filigree engagement ring. Accentuated with scrolled designs, millgrain trim, and chevron carvings, the 18k white gold filigree band of this engagement ring delights the eye. Nestled in the midst of this filigree is a round brilliant cut champagne diamond. Fancy yellow brown in color, this diamond solitaire weighs 1.03 carats. Rings like this vintage style one are from the Topazery Earth Collection. Baguette cut diamonds and a leaf and floral design join forces with a fancy champagne diamond in this chic antique style engagement ring. The flowers and fronds that are carved on the 18k white gold band of this engagement ring give it a garden flavor. The round brilliant cut champagne diamond that centerpieces this ring weighs 0.70 carats. It is flanked by eight channel set straight and tapered baguette cut diamonds at the shoulders. The combined weight of all the diamonds is this engagement ring is 1.05 carats. From the Topazery Earth Collection. The earthy intensity of champagne diamonds warms both the heart and the spirit. Drawing on romantic filigree settings from vintage and antique eras, we infuse a splash of modern-day flavor into these new antique-style engagement rings. From vintage floral and leaf motifs, to dramatic contemporary designs, our rings are delightfully sophisticated and oh so chic. Does she love autumn leaves and bonfires? Are her favorite shoes a pair of hiking boots? Does her ideal weekend involve sleeping in a tent? Or maybe she loves autumn in the city when the leaves start dancing on the sidewalk and swirling around the park benches? Regardless of her favorite things, if she's an earthy girl, she'll love a champagne diamond engagement ring. The diamond is the traditional gemstone for engagement rings. It's not surprising then that many vintage and antique engagement rings feature diamonds in some way. If you've ever wondered how the tradition originated, we've uncovered the history, lore, and a few other interesting facts about diamonds. Diamonds were first discovered in the fourth century B.C.E. First unearthed in India, diamonds traveled along the Silk Road routes from that country to China as objects of trade. Because of their strength and brilliance, diamonds were valued from the day they were first discovered. The light refraction of the stones captivated early discoverers, but diamonds were also coveted as cutting and engraving tools. In their earliest days, diamonds were also worn as talismans to ward off evil. Ancient warriors believed the precious gemstone would protect them during battle. Do vintage and antique diamond engagement rings provide the same good luck and safeguarding properties to a marriage? Perhaps. The Origin of the Word "Diamond"
The word diamond comes from the French word diamant, but its root lies in the Latin adamantem, which translates to "the hardest metal." A contemporary descendant of this word is adamant, meaning impenetrable or unbreakable. This meaning also gives the diamond its reputation as a symbol of eternal love and unbreakable commitment. Archduke Maximilian of Austria was the first man to propose marriage with a diamond ring. In 1477, he proposed to and married Mary of Burgundy. At the time, only royals and the very upper crust of society could afford diamonds given the gemstones' rarity. The use of diamonds in engagement rings gradually evolved. The Romans were the first to make the connection between diamonds and betrothals. Considered "truth" rings (which is also where the word betroth comes from), and presented as a symbol of friendship or affection as opposed to a precursor to marriage, diamond rings of this time were worn on the third finger of the left hand. This placement bore tremendous significance because the Romans believed the vein in that finger extended directly to the heart. Pope Innocent III can be credited with bringing together the diamond and the engagement ring. His declaration in 1215, that would-be brides and grooms must enter into a waiting period between their betrothal and wedding ceremony prompted the giving of diamond rings as a sign of commitment while waiting out this term. This practice set the stage for the earliest diamond engagement rings to assume the roles they continue to play today. There was a time when women favored colored gemstones such as sapphires, rubies, and emeralds in their engagement rings. Then, in 1938, the jewelry company De Beers began using the advertising slogan "A Diamond is Forever," and engagement rings were never the same again. Centuries after they were first discovered, diamonds continue to hold allure. The waiting period Pope Innocent III mandated so long ago is today a period of planning, excitement, and expectation that is often still sealed with a diamond. 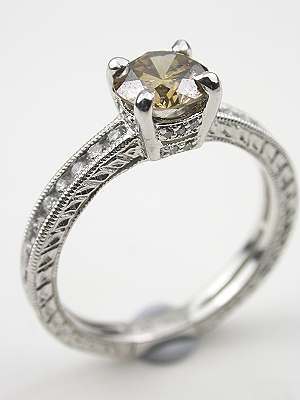 Vintage and antique diamond engagement rings beautifully meld the ancient with the contemporary. Cheers to Champagne Wedding Inspiration! According to legend, when Dom Pierre Perignon perfected the bubbly wine that would go on to be called champagne, he exclaimed, "I am drinking the stars!" Although he may have been exalting the beverage's effervescence, champagne has a lot more going for it than just its texture. Its many qualities combine to provide brides with elegant inspiration for their weddings. An antique or vintage champagne diamond engagement ring, along with champagne-hued bridesmaids' dresses, will have your wedding day bubbling over with the light and radiance of the stars. Because champagne diamonds all fall into the same color family, light, medium, and dark variations of them blend together seamlessly, regardless of their depth of saturation. As a result, brides who extend their champagne diamond engagement ring hue to their wedding's color theme have a lot of flexibility. Perhaps one of the biggest perks is allowing their bridesmaids to pick their own dresses in any champagne shade. In this way, bridesmaids can complement each others' ensembles while embracing their own individual styles. They may also walk away from the wedding with a dress they'll actually wear again. Of course, brides who prefer their bridesmaids in a single color can still fulfill their wish while continuing to offer their attendants flexibility in their wedding attire. Light champagne colored bridesmaids' dresses in a variety of styles are perfect for summer weddings, especially beach and destination weddings. More dramatic, darker-hued champagne bridesmaids' dresses lend a blush of coziness to winter and evening weddings under the pale moonlight. Because of their splash of warmth, champagne diamonds glow with a softer illumination than traditional diamonds, especially when set in antique and vintage bands. Cushion settings, filigree cutwork, and accenting diamonds all enhance the beauty of champagne diamonds in engagement rings. And contrasting metals like platinum and white gold enhance the warm glow of champagne diamonds even more. For these same reasons, champagne colored bridesmaids' dresses are even more elegant when splashed with glittery and sparkling accents. Sequins, pearlized beading, rhinestones, and fabric flowers can all add enchantment and sophistication to champagne bridesmaids' dresses.